From nieuwigheden van 2019 zijn nog niet onthuld! Kom binnen een paar dagen terug bij ons. Escape every weekend, go on vacation or enjoy your retirement in an incredible complex at the whim of his desires between mid-March and mid-November. . . 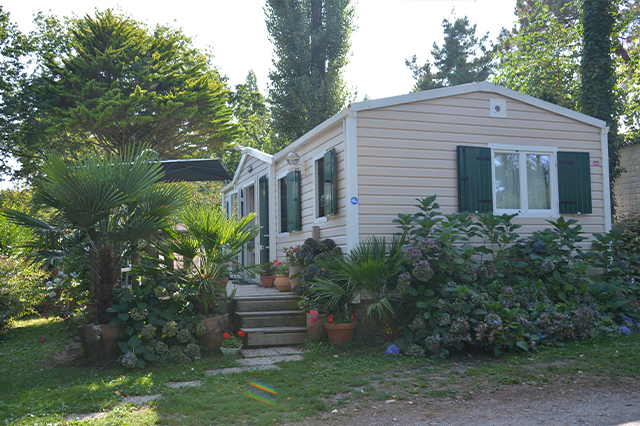 Become owner of your mobile home in Loire Atlantique in a 4-star campsite with many services and benefits. Buying a second home crosses your mind. You want to get out of everyday life and feel at home in an attractive area close to the sea and the beautiful coastline of the Atlantic coast. The ideal solution may be found on the Domaine de Léveno in Guérande, in the heart of salt marshes, at the gateway to Brière Park. A typical second home is a major investment that can be expensive and time-consuming in the long run. Property tax, maintenance (more supported oceanfront), grounds maintenance, resale difficulty etc. Buying a house close to the sea is not a decision to make lightly and must be considered in the long run. Acquiring a mobile home and installing it on a camping plot turns out to be a good choice in some situations. With a financial contribution starting more content, it is then to rent a site annually. A formula that bypasses the use of credit, and so spread his investment without the bank fees sometimes expensive. Some fees are eliminated such as the property tax or the maintenance of the external parties (clippings, size of hedges etc.) which is provided by the welcoming establishment. Easier and cheaper to maintain than a house or a classic apartment, a mobile residence is movable recreation and provides flexibility to its purchaser. No compromise on well-being! 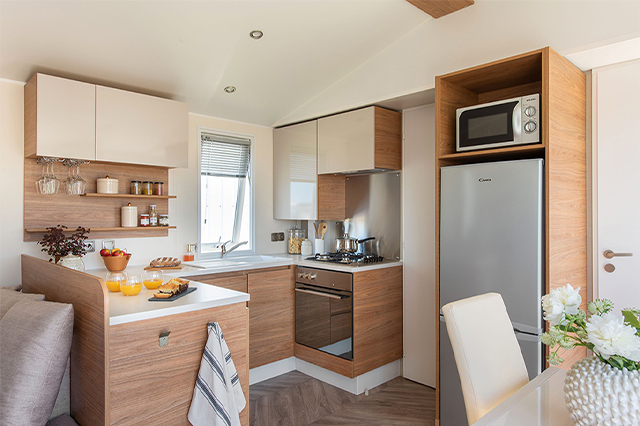 The residential range mobile homes are now very comfortable and spacious. You will be surprised by the modernity of the houses and the intelligence of the interior fittings, designed and designed by specialized architects. Have you planned a water park in your holiday home? A courier service or playgrounds in your garden? What may seem utopian with a holiday home becomes a reality by opting for the proprietary formula of the Domaine de Léveno. Discover breathtaking infrastructures, a complex of pools with water slides and covered pool. Play areas for children, a mini-farm and incredible sports areas. Enjoy with all your family (or your grandchildren) all the high-end services of the campsite in peace! Joining the Guerande region also means enjoying a pied-à-terre well located for accessing the various tourist attractions of the region. A few minutes from the ocean and the seaside resorts of La Baule, La Turballe and Pornichet; 20 minutes from the city of Saint Nazaire, known for its famous bridge and its dynamic economic activity; one hour from Nantes and the airport; Guérande, a medieval town steeped in history and culture, is the ideal crossroads between the lands of Vendée and South Brittany. 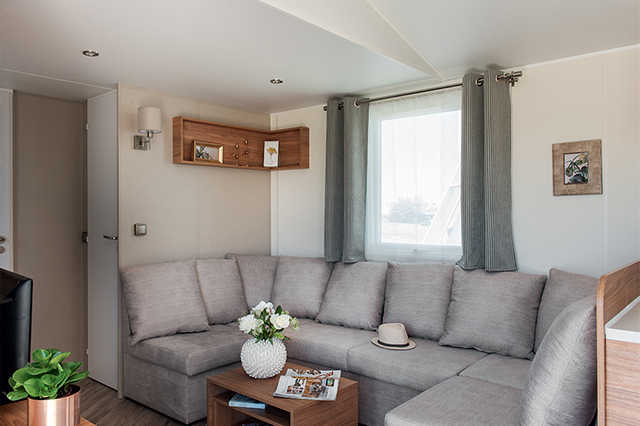 Enjoy your property during high periods of attendance does not matter to you and you want to limit the cost of your annual rental, the sub-lease of your mobile home is a service offered by the Domaine de Léveno. After having defined by a contract the terms and periods of availability, the campsite deals with all rental management (arrivals, departures, households etc). The campground is accessible for residents from mid-March 2019 to mid-November 2019. Packages include electricity up to 200 kWh, water, mains connection. The flat rate of € 3,500 includes gas consumption. This charge remains that of the resident for the package to € 3,300 (difference of package depending on the sector on the campsite). Access of owners, ascendants and descendants is included in the package. Third party access is priced. For more information, please contact contact us using the drop-down menu on your right or directly by phone (also available on the right tab). You want to buy a used mobile home and install it on your land, or for any other use? The Domaine de Léveno in Guérande offers several models for sale. Consult us to learn about the current possibilities.